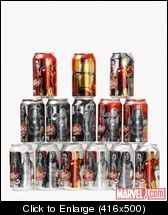 Did anyone collect the entire Iron Man 2 USA Dr Pepper Set? I tried to, but again I couldn't find all of them in my area. Here is the picture of the set. Anyone have the bigger can, I believe it was only sold in Canada?